I still remember the day a few years back when David Tamarkin, the site director of Epicurious, announced to me that he had chosen a word to summarize the brand’s new approach: realness. Having worked alongside David for (not even kidding) more than ten years, I know that when he says realness, he means it. It’s not just an ethos that he applies to everything on the Epicurious site; realness is David’s way of life. Which is why it didn’t surprise me that one January, he challenged himself to make three meals a day, with very few repeats, for the entire month, a project he dubbed “Cook90.” That project is now a book (buy it! ), which is, I’m happy to say, our January selection for the Bon Appétit Cookbook Club. In a world of aspiration and lifestyle and glitter bagels and CBD water, Cook90 is the ultimate distillation of “home-cook realness,” to use David’s terminology. It’s not about the latest iteration of Keto or how amazing your life will be if you eat cold oats that have been sitting in your fridge overnight. The Cook90 book is unflinching in its dedication to recipes, tools, and strategies that make weeknight cooking not just possible but enjoyable—like a gift to yourself rather than an end-of-day chore. And the concept is totally, refreshingly un-prescriptive: Cook the recipes in the book, or simply cook whatever you want. Either way, you’re still doing Cook90. Before David walks over here and says that I am telling people they don’t need to buy the book and can just cook whatever recipes they want, let me just add one final note: Even as someone who is pretty much resigned to being what I’ll call a “Cook9” (and that’s in a good month, and yes I’m including breakfast in that figure), David’s perspective on cooking is so smart and practical, and his voice is so candid and—yes—real, that he makes the prospect of cooking 90 meals in 30 days feel not just accomplishable but truly rewarding. Later this month, we’ll be sharing some of our favorite recipes from the book. And in lieu of a blowout Cookbook Club dinner, we’re all going to bring “nextovers” (the Cook90 term for non-depressing leftovers) to work one day and trade lunches with each other. That, my friends, is realness. Pick up a copy of Cook90 wherever you buy cookbooks. And if you want to learn more about the BA Cookbook Club and how to start your own club, you’ll find all that right here. Normally I live by the Groucho Marx maxim “I don’t care to belong to any club that will have me as a member,” but made an exception for the newly launched Bon Appétit cookbook club. You get food at the end? Okay, I’m in. 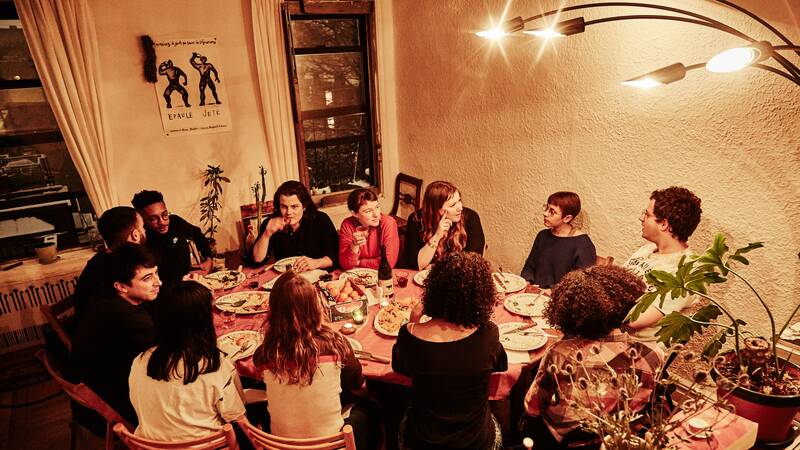 16 staffers and not a single man (you know who are—and you better join in next month or ELSE) cooked recipes from Nik Sharma’s beautiful new book, Season, and gathered around the table to talk about how it went. I made a pineapple-serrano infused gin cocktail that had me squeezing pineapple pulp in cheesecloth over my sink at 8 a.m. like an amateur milkmaid, which was a first but not a last. The finished cocktail had a subtle heat and clean pineapple flavor—refreshing! Molly Baz made chaat masala-rubbed pork chops (pictured above) that wowed us all, Carla Lalli Music made lamb-stuffed mashed potato pancakes I wanted to sit in close proximity to, and Carey Polis’s sweet potato bebinca, a smooth pudding cake of my favorite texture (jiggly), was all I wanted for breakfast today. The challenge to tackle a recipe you might not have otherwise, coordinate and gather with friends around a table, talk about your successes and pitfalls in the journey of cooking—it’s not just for Thanksgiving! Find a cookbook you’re excited about and give it a go. A Google doc and a little planning is all it takes. You know how people lie? They say, “Yum! That was delicious.” But you can tell they’re just saying what they’re supposed to say as dinner guests at your table. And I can live on that alone! But sometimes they tell the truth and in those moments you bask in the glory. I made this winter squash carbonara recently and everyone at the table went back for seconds, using tongs to grab extra slivers of chopped bacon. My great aunt, whose kitchen I was crashing, went back for thirds. And she does thing where she puts a New York menu price on the dish, which I love. “You could charge $16 for this!” She told me over the blasting audio of whoever was pontificating on MSNBC. “At Via Carota!” She added. My heart was full. The roasted squash melts into the noodles + egg yolks + pasta water and becomes creamy, coating each strand. The bacon is bacon. We added a little Lacinato kale for health. Make this pasta. This chicken cutlet is a great recipe, but a lot of people decide not to make it because they can’t find Maggi seasoning (a super concentrated “flavor enhancer” like extreme soy sauce). It goes in the buttermilk ranch dressing that’s doctored up with crème fraîche, onion powder, and garlic powder, the ingredient we waxed poetic about this week. Why use garlic powder instead of fresh? You can find out here, and then buy yourself a new jar, because yours looks dusty. Speaking of natural wonders of the world, we’ve have a purple Japanese sweet potato on our snack table for a few…months now. When it finally sprouted, Basically editor Amiel Stanek started referring to it as his “son.” Suddenly we were all emotionally attached to this grotesque and lumpy potato boy. As it sat in the sun, more sprouts grew into what looked like a curly head of hair atop the potato head. This week, Brad Leone walked over and gasped in delight: “Look at that! You can plant it in some dirt and it’ll sprout more sweet potatoes.” Alex Delany popped up from his desk, “No it won’t,” which really riled Brad up. “PUT IT IN THE DIRT, YA DINGLE!” He said. “I do it every year—decoratively.” So when the time is right, we might just do that. If Amiel can say goodbye. I’m intrigued by udon master (and BA Hot 10 chef) Tsuyoshi Nishioka’s obsession with dreams. Am I workshopping my life goals enough? Clearly not. Am I eating enough udon? Also no. I gotta work on that. Apple announced a few new food emojis this week, the most controversial being this shiny, dry-looking abominably plain bagel. “Dewy,” wrote Healthyish editor Amanda Shapiro, shuddering as she typed. “It’s like a Ken doll version of a bagel,” said restaurant editor Elyse Inamine. “The inside is like unexpectedly looking into a high def zoom mirror that shows you all of your pores,” said editorial assistant Jesse Sparks, who’d rather not catch that glimpse. “Uncomfortable,” noted social media manager Emily Schultz. “rly firm” typed editorial assistant Emma Wartzman. Molly Baz uploaded an image of a Thomas brand bagel for some reason. Like the drooly face, clown face, and blue bowl with NOTHING IN IT, the new bagel will be relegated to the emojis of little purpose file. At least it wasn’t…blueberry? No matter how many times she’s tried, Naz Deravian can’t remember the last meal she ate in Tehran. It was 1980 when her family fled the city in the thick of the Iranian Revolution and the hostage crisis. She was eight years old. Deravian only recalls what she ate when the family landed in Vancouver: a McDonald’s quarter-pounder with cheese and a side of french fries. The meal was heavenly, but it was a far cry from a bowl of restorative aash, a Persian soup bursting with legumes and green herbs. Deravian, now 46 and living in Inglewood, California, has kept an award-winning Persian food blog, Bottom of the Pot, since 2013; she makes a living writing about food and occasional screen acting. 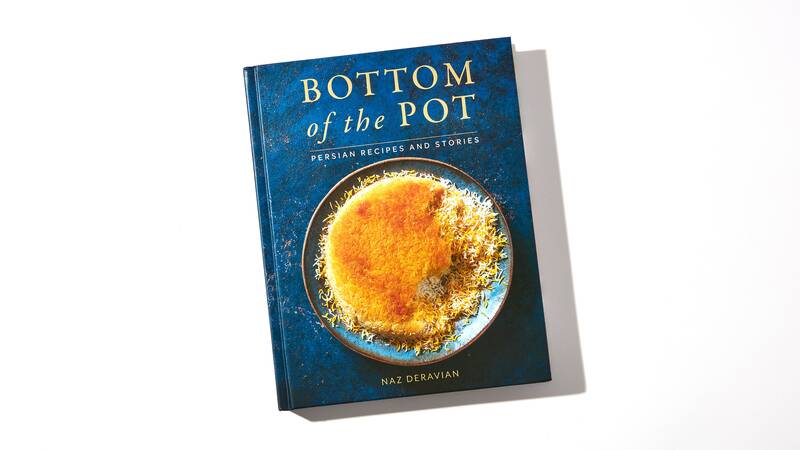 This month, her first cookbook, Bottom of the Pot: Persian Recipes and Stories, is out from Flatiron Books. Deravian writes with a sure hand, treating chapter and recipe introductions as forms of memoir; like her writing, the book’s photographs are lush, almost wistful. The nearly 100 recipes within are a nod to her heritage: khoresh fesenjan, a sour pomegranate walnut stew; morgh ba zafaran, chicken cooked in saffron water; pistachio sanbuseh, airy turnovers padded with ground pistachios and perfumed with cardamom and rosewater. Deravian wrote the book with two audiences in mind: those unfamiliar with but curious about Persian food and a younger generation of Iranians who, like her, may live abroad but crave the food they grew up eating. Every recipe is a self-contained story, headnotes sometimes lasting paragraphs as Deravian zigzags through time periods and memories, demonstrating how displacement fosters its own kind of culinary education. Though she dabbled in the kitchen as a child, she began cooking for herself when she moved to Los Angeles to pursue acting in 1996. She called her mother up in a fit of desperation, gripping a notebook and pencil and asking her to dictate her recipe for crispy Persian rice, or tahdig. Cooking came naturally to her from there. “The kitchen became a place where I could escape, relax, and reconnect with myself,” she writes. She noticed that the blog posts that generated the greatest number of kind comments and letters from readers were ones with deeply personal anecdotes attached to them. These were recipes like aash-e reshteh—a soup of beans, herbs, and noodles to be eaten before the Persian New Year—which she used as a vehicle to tell to the story of teaching her young daughter, Luna, the meaning of the word azadi, Farsi for “freedom.” Another recipe for aash-e anar, a tart pomegranate soup, told Luna the story of Shab-e Yalda, the winter solstice celebration in which families gather to eat and read poetry late into the night on the longest night of the year. She was using recipes as a medium to explain her own heritage. In Bottom of the Pot, she synthesizes them to tell her whole story. As she wrote and cooked her way through the book, Deravian’s parents fell ill.
“It became even more imperative for me to get these stories down,” she said. “To listen, to ask questions, to be present.” Time took on a new meaning for her in this period, and she extracted recipes and stories from them both. Her father, who died in May, told her the stories of dishes like aash-e dogha, a soup of full-fat sour yogurt with beef meatballs. He explained that their family’s recipe had originated with her paternal grandfather, who picked it up when he was a rice merchant in Baku, Azerbaijan, and brought it back to Iran’s Gilan Province. 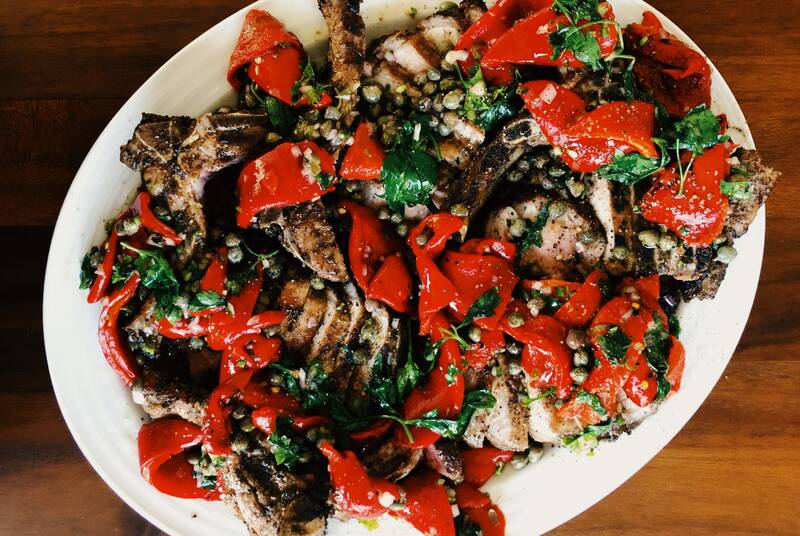 The recipe traveled through generations—and, eventually, continents. There was a lot of noise, she told me, people shouting opinions and making declarations about the value of Iranian immigrant lives like her own. The best she could do was drown out the noise, hunker down, test her recipes, and keep writing.